Not gross, but if you are a little squeamish, don’t click the picture for the big one. The green arrows, hand drawn by me, should show the two problems. 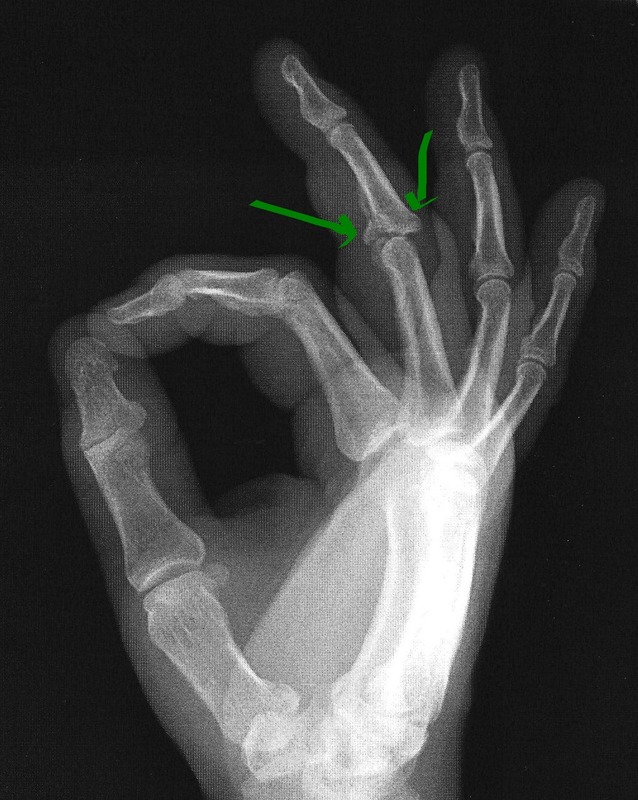 First is on the left of the image, a chunk of the knuckle has been broken off. Yeah, that hurts. But the other arrow, on the right hand side, explains why it hurts when it is straight. Its been hyperextended. Don’t google that term if you are squeamish. Take it from me. It ain’t pretty, and some of the images can be quite upsetting. It explains why, minutes after this happened, when I flexed the finger (last time for a while) it felt … different, like it wasn’t working in the socket. I thought it was a minor injury … a dislocation … at first. This morning the PA said its pretty much the worst type of fracture I can do. Geez. Can’t a guy cut a break? Yeah, it ain’t pretty. Surgery this week to hopefully fix.